The parrot is a type of familiar which can be found on the oceans. It is one of the few types of familiar that can be recolored, provided the parrot isn't in one of the colors prohibited from recoloring. Parrot with hat familiars are not able to be recolored except in the very rare cases where both colors would normally be recolorable, in this case when both colors were magenta and/or lime when the parrot spawned. 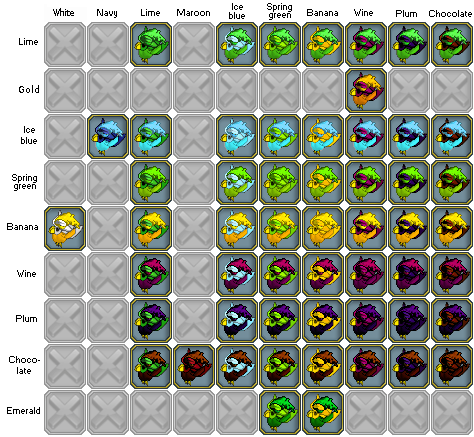 All possible parrots with musketeer hats (excluding recolors) are shown below. It's unknown which of the possible booch box combinations actually exist in-game. This page was last modified on 9 February 2018, at 21:00.